Utilization of the GladHoster sites and administrations demonstrates your agree to the gathering and utilization of data as depicted underneath. Any inquiries which you may have with respect to this protection arrangement ought to be coordinated to info@gladhoster.com. We request that you supply certain data when you utilize our site, particularly when you sign up with us as a client. This data will be utilized as a part of the administration we could call our own database and to empower us to contact you about the administration you have asked (for instance, to affirm the enrollment of a space name or to advise you of the need to replenish your enlistment when it terminates). We might likewise utilize your email location to send you our normal GladHoster bulletins. On the off chance that you wish you may quit from getting these bulletins (see “GladHoster Newsletter” underneath). Likewise, when you utilize our site we may store your IP location and may utilize this data to control our site and help to analyze any system or server issues. We may utilize treats to stay informed regarding your utilization of our site and e-business framework. Data went to us from your web program may be put away and utilized as a part of our inward measurable investigation. We might likewise consequently gather non-individual data about you, for example, the sort of web programs you utilize or the webpage from which you connected to our site. You can’t be distinguished from this data and it is just used to help us in giving a powerful administration on our site. 2. Do we share the information with anyone else? 2.6 so as to help us in comprehension our client base some unknown data (i.e not name or particular location) might now and again be gone on to an outsider for information examination. Charge card installment for our administrations is prepared by our protected installment administration supplier. We don’t record your charge card points of interest on our database and the installment administration supplier does not record whatever other data about you. Now and again GladHoster will send bulletins to those clients who have picked to be incorporated on our different client mailing records. New clients have the chance to choose to pick in or out of these mailing records when they first sign up with us to make a record. Existing clients or other individuals who are occupied with the bulletins may pick in or out by sending an email solicitation to our bolster group. Now and again GladHoster may offer extra administrations to our clients. Sometimes these administrations may oblige us to pass individual information held by us to an outsider. Any such administration will be discretionary and the offer will be to the individuals who have picked in at the season of sign-up or generally. 6. How long will we hold data on you? 7. Where is the data we hold stored? Data which you submit by means of our site is put away on a PC and in some cases on paper at our workplaces. This is important so as to process the data and to send you any data you have asked. GladHoster places extraordinary significance on the security of all data connected with its clients and has efforts to establish safety set up to endeavor to ensure against the misfortune, abuse and change of client information under our control. With respect to our site, we may utilize secure server programming (SSL) to scramble data you enter before it is sent to us. While we can’t guarantee or certification that misfortune, abuse or adjustment of information won’t happen, we utilize our earnest attempts to keep this. 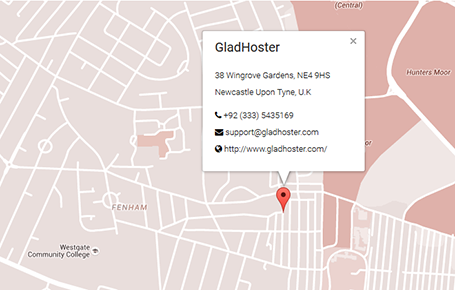 The GladHoster site contains promoting and connections to different sites. No individual data is gone to different sites in the event that you take after one of these connections. GladHoster is not in charge of the security practices or substance of connected sites. We would urge you to peruse the security explanations of different sites, subsequent to their protection approach may contrast from our own. On the off chance that you have to change the data that we keep, for instance in light of the fact that you have moved or to revise a blunder, please contact us. Utilization of the GladHoster site and administrations demonstrates your agree to the accumulation and utilization of data as depicted in this strategy. Any progressions to the strategy will be posted on this page. On uncommon events it is important to convey an entirely administration related declaration, if, for case, an administration is incidentally suspended for support. By and large, clients may not quit these correspondences, however they can deactivate their record. You are in charge of the security of your Account Number and passwords. Verify you keep it in a sheltered place and don’t impart it to others. Never forget to log out after your session closures, to guarantee that others can’t get to your private individual data. You ought to take this safety measure regardless of the fact that you are not utilizing an open PC, for example, at a library or web bistro, yet notwithstanding when utilizing your private PC as a part of you’re home. We are group of people who provide their services with passion and dedication to our valued clients. © 2014-2017 GladHoster. All rights reserved. GladHoster is a hosting company with desire & passion in web development & hosting. We are committed to provide you affordable but top class web hosting space.